I normally prefer to use the Hunspell spell checker in Trados Studio: I can set the various parameters from within Studio (instead of having to change them in MS Word), and I don't mind that Hunspell normally flags more false positives - I actually prefer that to MS's sometimes more permissive approach. There are, however, times when you need to change the spell checker used - for instance, if the language version used in a project is not supported by your default spell checker. 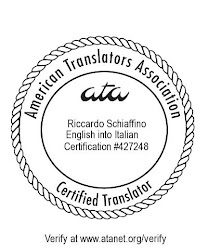 This happened to me in a recent project: the customer had set it as English to Italian (Switzerland), instead of the normal Italian (Italy). Hunspell does not have a spell checker for Italian (Switzerland), so Studio was not performing any spell checking at all - if you selected the Tools menu you would see the spell-checker option grayed out. In such instances the workaround is simple: just go to Tools > Options > Editor > Spelling, and select the other spell checker. In my case, I switched from Hunspell to MS Word's, and I was able to check my project. In other instances you may try the reverse (selecting Hunspell when you normally use the MS Word spell-checker). This is useful, for instance, if your installation of MS Office does not come with the spell-checker for a certain language. Hey, Thanks for sharing this. Something I was looking for. Riccardo, I have a similar problem with SDL Trados Studio 2009. If I open the sample project/Word file, F7 is active. But F7 is now greyed out if I open a client's project, even if I've selected the source language to spellcheck in Options. I have custom.dic as my dictionary, so I'm stumped. Any ideas? Thanks! 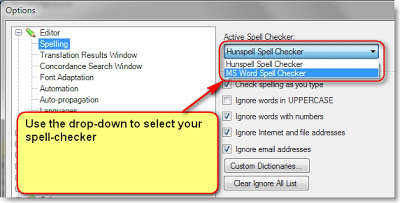 Have you tried switching the spell checker as mentioned in my post? I don't think this has anything to do with custom.dic - as far as I know that is only the place where your exceptions to the suggestions from the spell-checker go. I think that this may again have to do with a conflict between the language variant selected for the project by your customer, and the languages available to your spell-checker. My problem is that Trados 2014 keeps defaulting to the Hunspell checker and I need to keep selecting MS Word (because I have an exclusion list here.) Has anyone else had this problem?